Reads through your installed workflows to tell you what they do. Currently, there is just one command: help. The workflow crawls through your installed workflows and pulls out the information about keywords and hotkeys among others and compiles a temporary help file that it shows view a quicklook debug utility. The file can take a few seconds to generate, and it is generated every time. This will change in a later version. This workflow displays the file generated through a debug mode of Quicklook (so that the focus doesn't need to switch to finder), so there will always be a "[debug]" message on the window. I've included a Quicklook Markdown generator in the workflow to make sure that the file always displays correctly. There are some images that are included that are not currently used (these are in the "images" folder). They will be used to show the hotkeys later. ALP is included. Right now, only part of the library is used, so I might strip it down to make the workflow smaller. So, the size of the workflow is larger because of these things in there. Built on Mountain Lion (10.8.3) Should be compatible for all systems as the only dependencies are included in the workflow. Clean up the help.py code. Cache the generated file and update it only when the workflow folder changes. Make the display of the file nicer. Add in more images to the file. 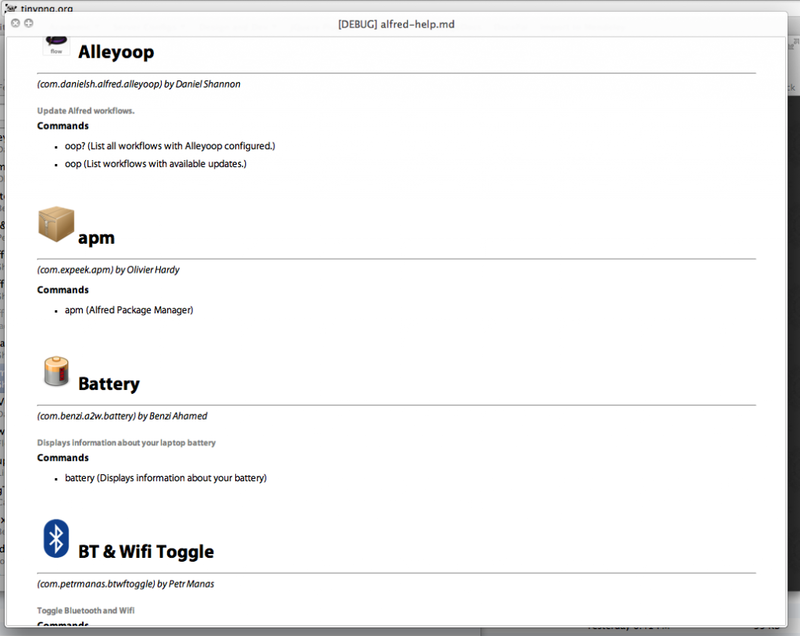 Display individual workflow helps (show the data for that workflow as well as the readme.md file). Have a better precedent to show either text or subtext for the command help. Try to figure out a way to describe arguments taken for different commands / hotkeys. Make it understand file actions better. Clean up the file/folder structure. Some other ideas are written into the source code Maybe some more... any ideas?